CIYMS have thrown down the gauntlet to the rest of the Robinson’s Services NCU Premier League with the signing of the former Warwickshire seamer Mark Adair. Captain Nigel Jones confirmed that Adair has joined the reigning Premier League champions from his home-town club Holywood. On the back of the signing of Obus Pienaar as new overseas professional, and after cruising to the league title in 2018, it is already difficult to see anyone competing with CI in 2019. Jones, who will have an embarrassment of riches at his disposal next season, confirmed that Northern Knights star Adair will be the last of the winter signings. 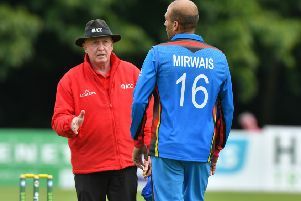 He has earmarked a key role for Adair as a strike bowler and will use his much improved-batting skills in the middle order. “We’re delighted that Mark has agreed to join us, we all know his qualities as a cricketer,” Jones said. “With the ball we will look to use him as a shock bowler, he’s a real wicket-taker, though he can bowl tight when he needs to. But we will hope he will take wickets with the new ball and then come back and mop up the tail. Jones won’t say it of course, but CI are already massive favourites for the main competitions next season. Delighted to have won the Premier League title after a six-year gap, they will be looking to dominate the domestic trophies in 2019 and mount a strong challenge for the Irish Cup.